Set up your Compak E5. 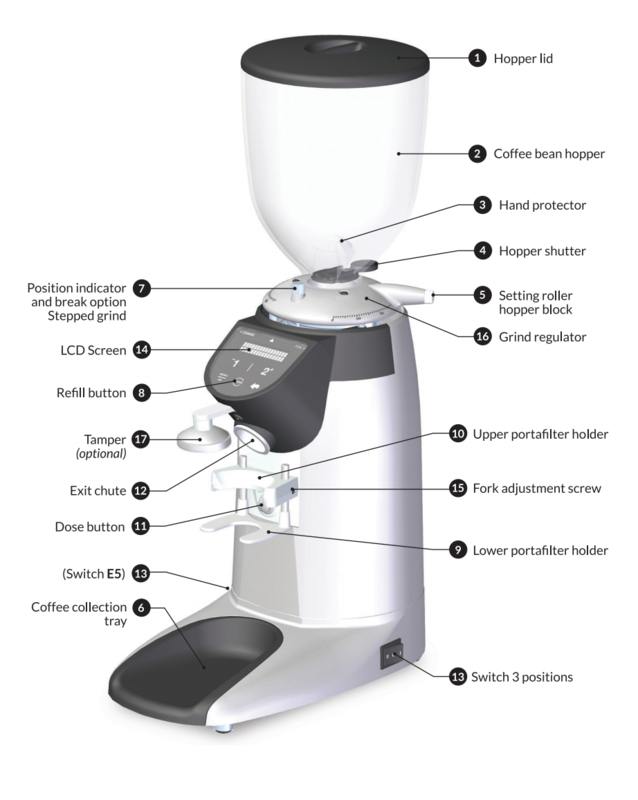 In this manual, you should find everything you need to operate and maintain your flat burr home espresso grinder. Please read carefully before using your Compak E5 espresso grinder. To adjust the grind setting, ensure that the collar's (16) set screw (7) is loosened by rotating it counter-clockwise until there is no more resistance. It is not removable, ensure that you do not loosen too far as this will re-engage the lock. Lower numbers on the collar indicate a finer setting, higher numbers indicate a coarser setting. Remember, this means that rotating clockwise makes the grind coarser and rotating counter-clockwise makes the grind finer – this is opposite to how most grinders operate. To adjust the timed dose settings press the menu button followed in quick succession by the number representing the dose setting you'd like to change. The display will begin blinking. By pressing the plus and minus buttons you can change the timed dose. To save and exit simply press the menu button again.